After almost 6 moths of designing, sewing, setting up my new shop Cabassole I am back to the up cycling part of me. Back to Moi Aussi activities and my main product - apron from upcycled jeans. I have received positive feedback from my Etsy friends who are also constantly busy with the improvement of their shops and products. One of the comments was about sides of my apron, which are not covered with fabric. In the beginning I was using only front of the old jeans. Then I have decided to use the back in order to propose the bigger size. The back of the same jeans is always larger. It is funny, but women choose only aprons made from front. The main purpose of the apron is to protect our clothes during cooking. One evening I did not want to work and just browsed blogs of couture, recyclers and eco-fashion designers. Without any purpose, just to pass time. Suddenly new idea highlighted my mind - how to improve my design. 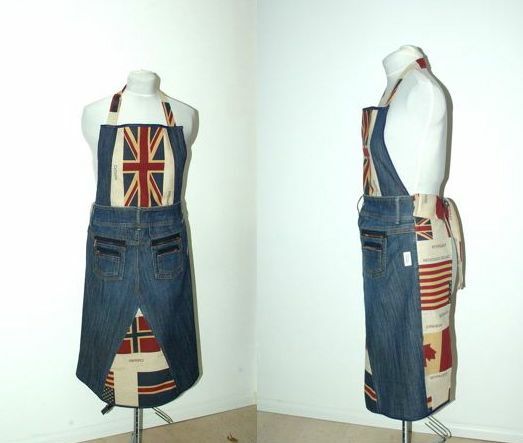 Here it is my apron from upcycled jeans with the side parts from new fabric. Cook in style and upcycle toooooo!